Ana María Carabias Torres: La Escuela de Salamanca. Perspectivas de investigación, SvSal WP No. 2015-03. 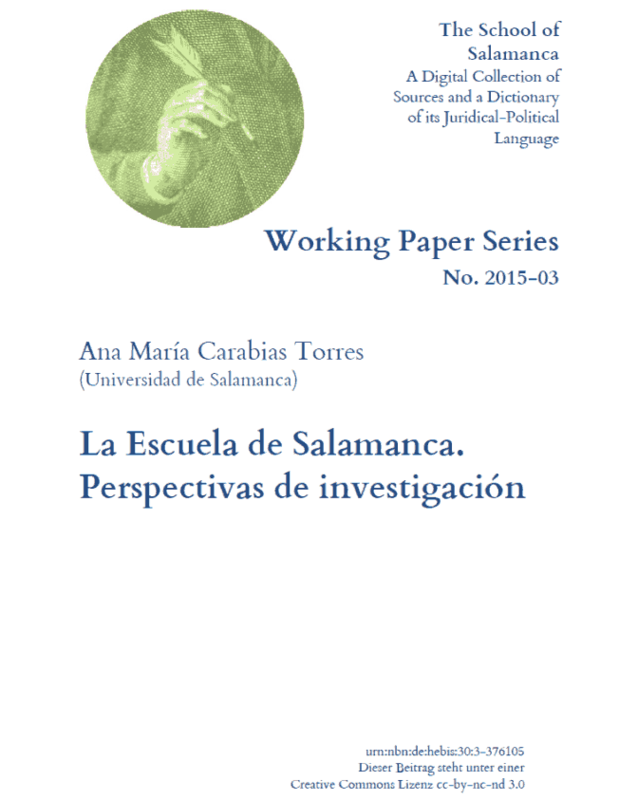 The article provides an overview of the recent research literature discussing the School of Salamanca and also offers perspectives for future research. It addresses the difficulties of a temporal definition of the School and proposes a broader approach to its topics. Research should not limit itself to the traditional topics of theology (moral theology, the problem of evil, the De auxiliis polemic, etc. ), law (natural law, human rights, sovereignty, the problem of just warfare, etc. ), and economics (private property, money, value and just price, interests, etc. ), but should also encompass issues of natural science such as space and time.